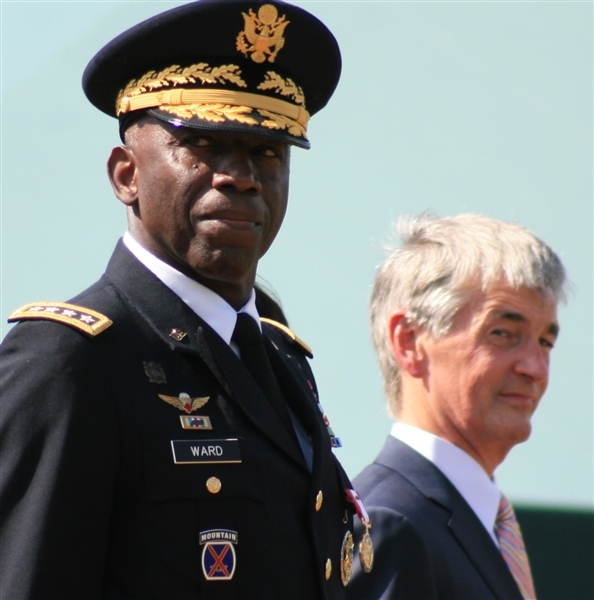 FORT MYER, Va., April 27, 2011 — Army Gen. William E. “Kip” Ward reviewed and salut­ed the troops for the last time yes­ter­day on Sum­mer­all Field parade ground here as he retired from a career that spanned four decades and cul­mi­nat­ed in his ser­vice as the first com­man­der of U.S. Africa Com­mand. Army Gen. William E. “Kip” Ward, left, and Army Sec­re­tary John M. McHugh watch as a cer­e­mo­ni­al unit pass­es the review­ing stand dur­ing Ward’s retire­ment cer­e­mo­ny at Fort Myer, Va., April 26, 2011. Africom stood up its head­quar­ters in Stuttgart, Ger­many, in Octo­ber 2007. Army Sec­re­tary John M. McHugh reflect­ed on Ward’s career. McHugh not­ed Ward is a Bal­ti­more native and the son of a World War II com­bat engi­neer who served at a time when the Army was seg­re­gat­ed. “I imag­ine it would have been easy, and indeed it would have been under­stand­able, if Kip Ward turned away, rather than turned toward and embraced the Army, both as an insti­tu­tion and as a career,” McHugh said. By fol­low­ing in his father’s foot­steps, McHugh said, Ward’s career is an inspi­ra­tion. “That a son of a sergeant in a seg­re­gat­ed Army would rise through the ranks to become one of only a hand­ful of African-Amer­i­cans in our nation’s his­to­ry to attain the rank of four-star gen­er­al is a tes­ta­ment to the integri­ty, tenac­i­ty, char­ac­ter and the abil­i­ty of Gen­er­al Kip Ward,” the Army sec­re­tary said. Ward said he was 22 years old when Air Force fight­er pilot Daniel “Chap­pie” James Jr. -– who lat­er would become the first African-Amer­i­can four-star gen­er­al — com­mis­sioned him as an infantry offi­cer in 1971. Ini­tial­ly, Ward said, he thought he’d spend four years in the Army and then go to law school. Wear­ing a star, Ward told the crowd of well-wish­ers, doesn’t mean it belongs to the one who wears it. As a com­man­der, Ward said, he shared his com­mit­ment to his troops with an equal com­mit­ment to their fam­i­lies. One of his priv­i­leges dur­ing his career, he said, was meet­ing America’s sons and daugh­ters, and car­ing for their fam­i­lies. “There is no greater hon­or,” he said.